This document describes the Account Manager options. 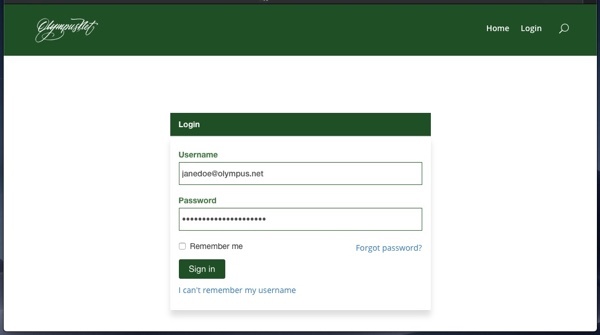 Click on Account Manager Login from the OlympusNet home page. The Login URL should read: https://secure7.userservices.net/manager/login?isprealm=olympus.net. Log in with your primary account username and password. Your primary account username is NOT your email address. Call tech support if you need help. The account status appears in the upper corner of the navigation. Pay my bill: Enter a bank card and click Post Payment for a one-time payment. Account Information: Update the account’s owner name, address or phone. Billing Information: Change name, address, phone associated with the bank card. Payment Information: Add/Remove bank cards and enable auto-pay. Update Password: Change passwords on any of your OlympusNet accounts, or the Account Manager login. Check My Statements: Access copies of your billing statements. Manage My Packages: Add Email address or Email Alias. Detail: When you update your card information, but no payment is made, a charge of $0.01 may temporarily appear on your online card statement in “pending transactions”. This authorization verifies that the card is valid and belongs to you. Once the authorization is complete, the charge will vanish, normally within 3 business days. Debit cards sometimes take longer to expire authorizations, depending on the bank. 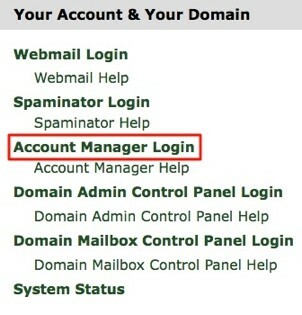 Note that Primary Account is the Username and Password used to log in to the Account Manager, above the other packages. Under the Username column, find the password you wish to change, and click the Action icon to the side of the password. In the new popup window enter the current password, the new password you want to change to, and the new password again in the Verify field. Click Save on the popup. Accounting Transaction Register lists charges, payments and credits in your recent billing history. 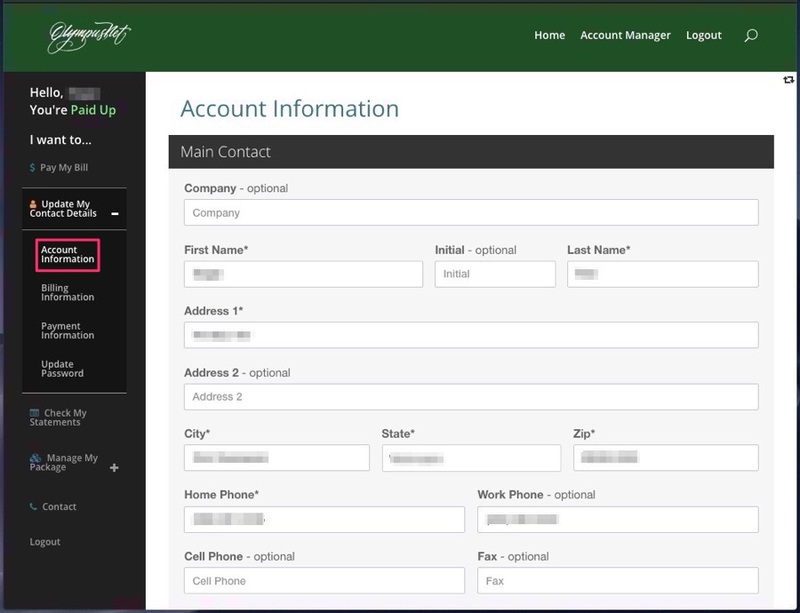 Show All checkbox allows you to view your entire billing history. Selecting any item in the Register under the Description column pulls up the details of the transaction for review or printing. Check what services you have active. Add an Email address or an Email Alias. Click on Subscribed Packages under Manage My Packages in the Navigation Panel. If you have more than one OlympusNet service, you may have a dropdown menu to select which service you want to look at (Email, DSL, Hosting). 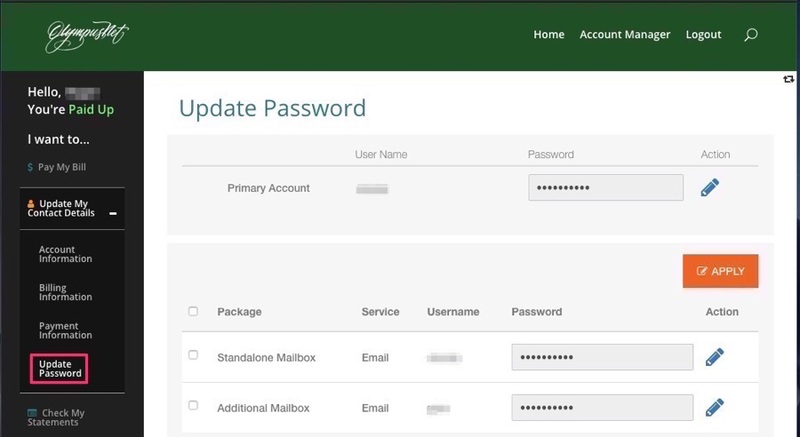 Passwords can be changed in this tool as well as in the Update Password view. Click on one of the active accounts, enter a new password in the Password and Verify Password fields and click the Save button. If you wish to deactivate an Alias, for example, click one of the active aliases (with green checkmarks) until you find the one you want to delete and click Deactivate. 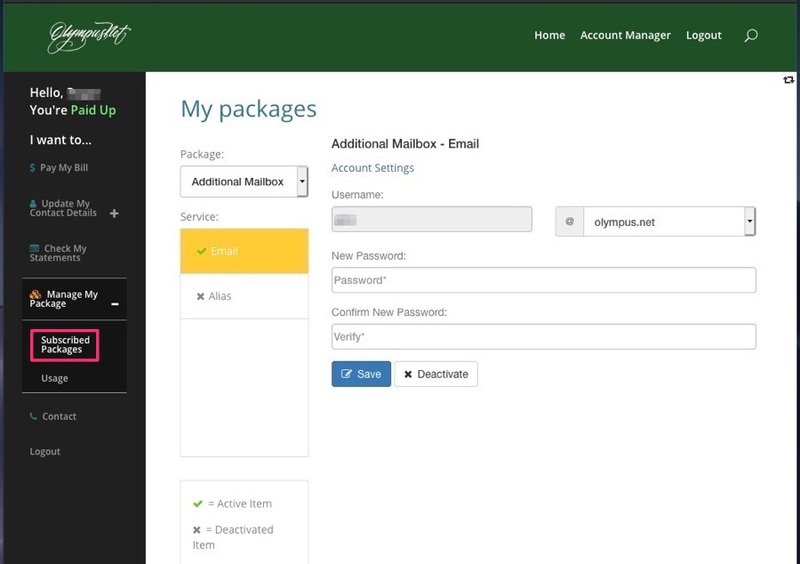 The other options under Manage My Packages are not relevant to current OlympusNet services. Fill in the name you want the Alias to be and select where to point the Alias. There are options to point the alias to one of your current Email addresses, or an Email address hosted elsewhere. Click Activate. Note that creation of an Email address does not set it up in your email application. That must be done separately.